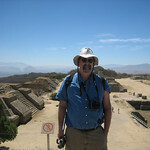 Visit the region nearby Oaxaca Mexico with the Amateur Traveler. When I was in Oaxaca I met Felipe Hernandez in the zocalo (main square). Felipe is a 4th generation weaver who has rejected the modern commercial dyes and practices and gone back to traditional zapotec methods and materials. His family speaks Zapotec at home which means that they may have lived in the Oaxaca area for around 2500 years. Felipe volunteered to be my tour guide and took me to see the big tree, the Zapotec ruin at Mitla and the Sunday craft market at Tlacolula. Then we went to Felipe’s house and he and his family showed me the weaving business. This video will come out in two parts. This first part briefly shows me the tour and then shows how to make a red dye out of insects (the cochineal) and how to cart, spin and clean the wool. 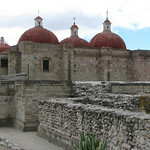 Also check out Oaxaca, Mexico – Felipe the Weaver (part 2) – Amateur Traveler Video Episode 47.